Nancy Sottos, the Swanlund Endowed Chair in the Department of Materials Science and Engineering, was honored for exemplifying founder Arnold Beckman’s vision of excellence, interdisciplinarity, and collaboration. Nancy Sottos, the Swanlund Endowed Chair in the Department of Materials Science and Engineering, is the 2019 winner of the Beckman Institute Vision and Spirit Award. The award, which includes $150,000 in research funding, is given every April 10 as the Beckman Institute marks the anniversary of Arnold Beckman’s birth. Beckman and his wife, Mabel, gave $40 million to the University of Illinois to create the Beckman Institute, which opened its doors 30 years ago. 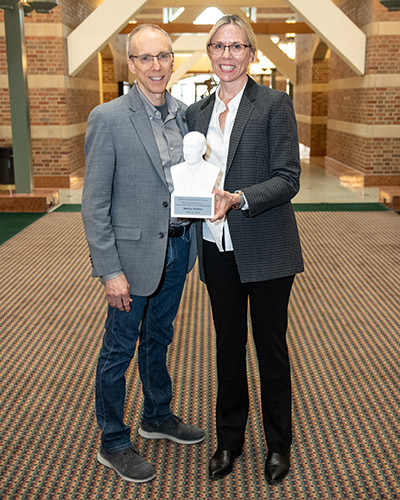 Beckman institute Director Jeff Moore recognized Sottos for her excellence in research, especially in creating rigorous experimental methods that tackle problems at the intersection of mechanics and chemistry. Moore also highlighted Sottos as a “power collaborator,” or a faculty member known for crossing disciplines and working with other faculty members and their research groups to offer new contributions to science and technology. Sottos started her career at Illinois in 1991 after earning a Ph.D. from the University of Delaware. Her research interests include self-healing polymers and advanced composites, mechanochemically active polymers, tailored interfaces, and novel materials for energy storage. She’s won awards for teaching, advising, and research. She is a fellow of the Society of Engineering Science and the Society for Experimental Mechanics. Sottos also leads the Autonomous Materials Systems Group at Beckman. She said she plans to use the prize money to support new research directions within the group. Sottos joined the Beckman Institute in 2001 along with her late husband and research partner, Scott White, who was a professor of aerospace engineering. She compared those relationships to being part of a family.